Offering this beautiful old book titled: Poems by William Cullen Bryant. Published by Hurst & Company, New York, no publish date, but definitely late 1800's. 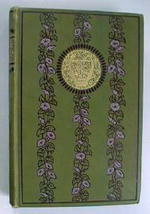 Green cloth hardboards adorned with impressed lavendar morning glory vines on the front, gold lyre impressed cameo in center, spine is decorated the same. Near fine condition, very minimal spine edge and corner rubs. Page edges are gold gilt on all three sides. Pages are clean except for pg 33 has a faint ink smudge near bottom. Title page and one other page have professional archival tape on page edges near seam (where they have started breaking away from spine). Spine is secure. This beautful book is filled with 237 pages of wonderful poetry. ( A sample: "Ye winds, ye unseen currents of the air, softly ye played a few brief hours ago; Ye bore the murmuring bee, ye tossed the hair o'er maiden cheeks, that took a fresher glow; Ye rolled the round white cloud through depths of blue; Ye shook from shaded flowers the lingering dew; Before you the catalpa's blossoms flew, light blossoms, dropping on the grass like snow.") A must have for your collection!